TEL AVIV – In response to the growing rocket threat to Israel's offshore energy assets, the Israel Navy is tweaking the design of its new Sa'ar-6 corvettes now under contract in Germany to make room for twice as many Iron Dome interceptors as originally planned. In an interview at Navy headquarters in Tel Aviv, a senior officer said growing quantities of 122mm Grad-type rockets and longer-range projectiles in the arsenals of Lebanon-based Hizbollah has prompted the Navy to rethink early requirements, which called for a single Iron Dome launcher to be integrated into each of the four ships now under contract with Kiel, Germany-based ThyssenKrupp Marine Systems (TKMS). 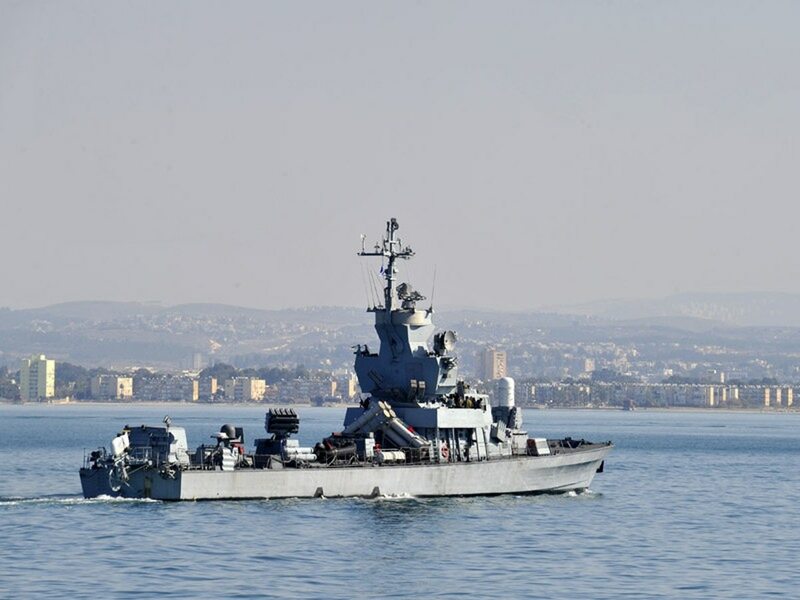 "Because of this growing threat, we're adding another [Iron Dome] launcher on the Sa'ar-6," the officer said of the new, 1800-ton displacement versions of the Blohm+Voss Class 130 corvette selected by Israel for defense of offshore assets in its exclusive economic zone (EEZ). According to the officer, each new Sa'ar-6 will be house two Iron Dome launchers, each capable of firing as many as 20 Tamir intercepting missiles. Those sea-based Iron Domes will defend against disruptive, possibly deadly and inexpensive shore-launched rockets while the Barak-8 anti-missile and air-defense system will defend ships as well as offshore assets against much more sophisticated and deadly threats, such as the supersonic, anti-ship P800 Yakhont cruise missile. Both vertically-launched systems – Iron Dome and Barak-8 – will be supported by the ELM-2248 Adir, a multi-function surveillance, track and guidance radar by Elta Systems, a subsidiary of Israel Aerospace Industries (IAI). In order to accommodate the radar's four phased array panels, the Israel Navy has been working for the past year to redesign the German vessel's baseline bow section to house three panels and the shape of the rear mast to house the final phased array panel. It's also been working for more than a year to redesign the crew berthing area to accommodate the radar and the Iron Dome and Barak-8 intercepting systems. The latest decision to add another Iron Dome launcher could delay slightly Israel's receipt of its first Sa'ar-6, which had been expected to arrive in so-called safe sail mode – without its combat weapons suite – by the end of 2019 or early 2020. Once the first ship arrives here, others are expected to follow in six-month intervals. Meanwhile, in parallel, the Navy is working with local industry to prepare the radars, intercepting systems and supporting electronic warfare suites for installation almost immediately upon the Sa'ar-6's arrival. According to the senior officer, the service expects it to take about six months to install everything properly and another eight months to one year of integration before the new EEZ-defense vessels can be certified as operational. "All the locally made systems will be waiting for the ships, and then it will take another period of time for installation and integration," the officer said. To mitigate risk, the officer noted that the service is using the INS Lahav, an Israeli-designed, US-built Sa'ar-5 corvette, as a test lab. Working respectively for more than a year with Elta and Rafael, the Navy has been demonstrating capabilities of the Adir radar and an improvised version of the sea-based Iron Dome; both of which have been installed on the Lahav. And by early 2018 or perhaps even at the end of this year, the officer said the service expects to deploy the new Barak-8 intercepting system on the Lahav. "On a single platform, we're putting new radar and two different intercepting systems; all of which are at the cutting-edge of technology. The risks are immense, but that's why we're learning so much about risk-reduction through all the work we're doing on the Lahav," the officer said of the corvette test bed. The four Sa'ar-6 corvettes on order with the TKMS shipyard have been the subject of an ongoing investigation into potential conflicts of interest among those close to Israeli Prime Minister Benjamin Netanyahu. The officer declined to discuss anything pertaining to the criminal investigation, but insisted that the ships were a top Navy priority and that the service had full confidence in the proven capabilities of the shipyard.